The lazy daisy days of summer are anything but that at Liberty Wildlife. Again, this year, the second orphan season in our new facility, is heading toward record numbers. Who’d have thought this would be happening? We worried that no one would be able to find us…not a problem. We worried that people in far-flung parts of the valley wouldn’t make the effort to drive to south Phoenix…not a problem. We were worried that people might not care enough to make the change…not a problem. A recent memo from Carol who oversees the hotline tells the story. After the recent Monsoon her e mail said: You know It was busy – most of the traffic ended up at the intake window. We took a total of 209 calls. Doug had the 8 – 11 shift and started checking the HL at 6:45. He was curious after the storms. He had 11 from overnight and ended up with 111 calls by the end of his shift. Lauri, Katie and I jumped in. It slowed a bit but Sue got 30 calls in 2 hours from 3 – 5 PM, Katie, 14 calls from 5 – 6 and Jon 20 from 6 – 8:30. FYI: We average about 10 – 12 calls in a 2 hour period this time of year. Taking a look at Liberty Wildlife, half way through the year, I am pleased to see that this community is compassionate, dedicated, and generous when it comes to caring for wildlife with whom we share the planet! Hotline calls and drop offs at the window prove this! 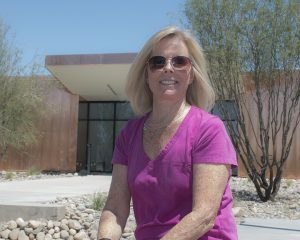 We also thought incorrectly that no one would visit during our public hours because the heat is so forbidding. And, this hasn’t really been a problem. Granted, no one seems to linger once the temps start to rise, but who would blame them? 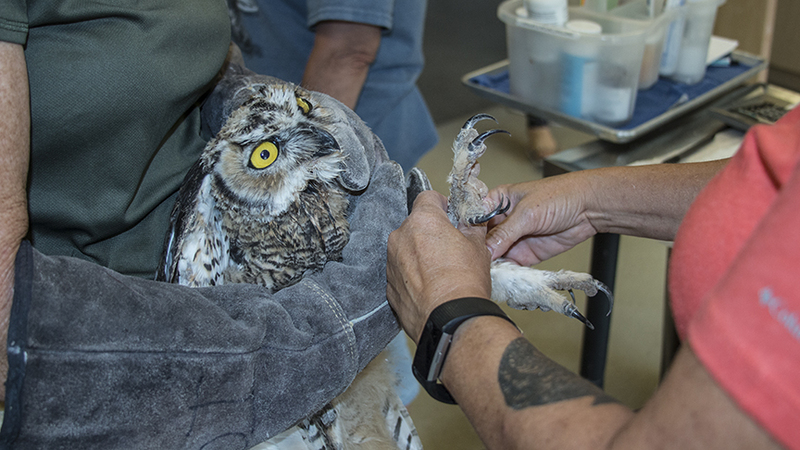 The important thing is that you care enough to make the effort to learn more about our wildlife neighbors and how you can assist in their well being. For this we applaud you! In an effort to continue to grow and provide the best programming to guests we will close our public hours through the month of August (the Hotline and Intake Windows remain open as always!) This gives you a time to hide from the heat, get ready to go back to school, or take that final vacation without missing anything exciting at Liberty. 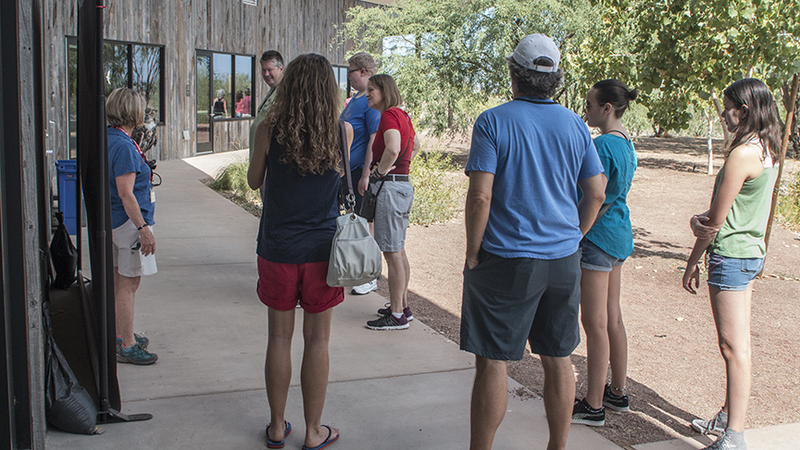 When we open again in September, it will be to new Open Hour programs, the introduction of new educational ambassadors, and new classes to train volunteers in advanced activities at Liberty Wildlife. Watch our web page for event announcements including updates on our October 20th Wishes for Wildlife. It will be a new and fun event with fabulous foods, auction items to bid on or to compete for. 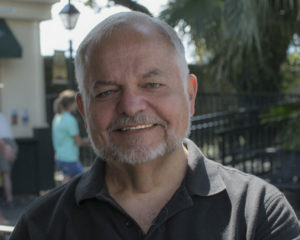 Our program will be sure to get you to laugh, think, and maybe learn more than you ever knew about our native wildlife. Just keep checking in for more information. Or, contact me at megan@libertywildlife.org to make sure not to miss out on this terrific night. All in all, this is a big thank you for your continued support. It keeps us going. It provides needed help for wildlife and nature. 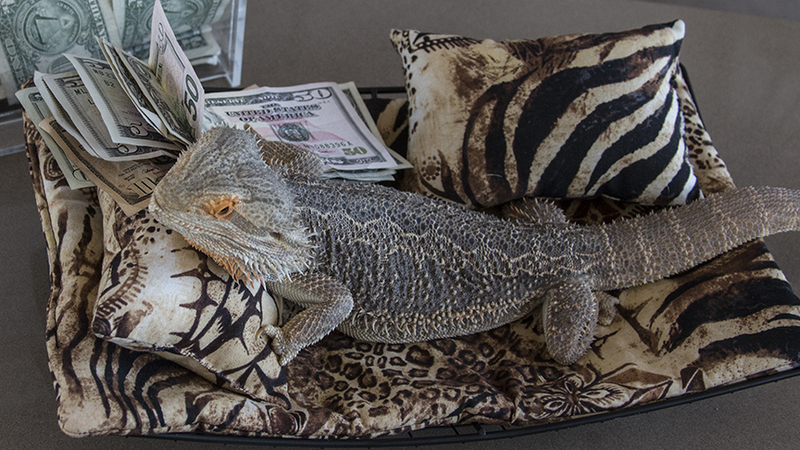 It makes a difference in your life and in the lives of many critters in need. The intake total for the year is now up to 6936. 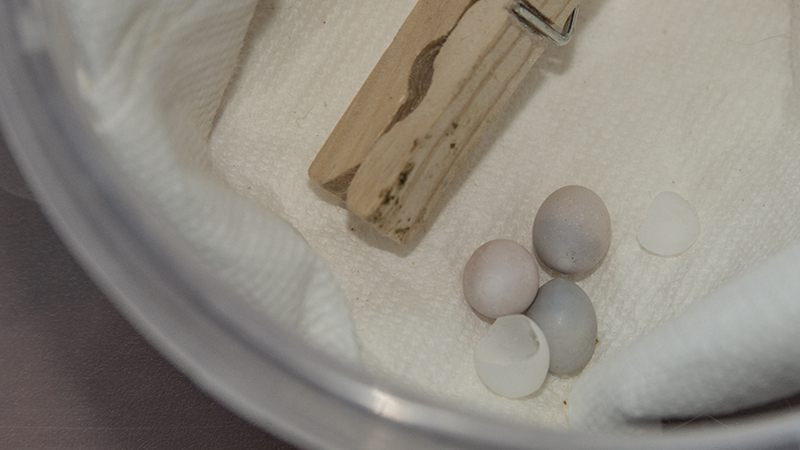 Susie Vaught (Liberty OC Coordinator) says someone found some tiny eggs recently out by the new enclosure. 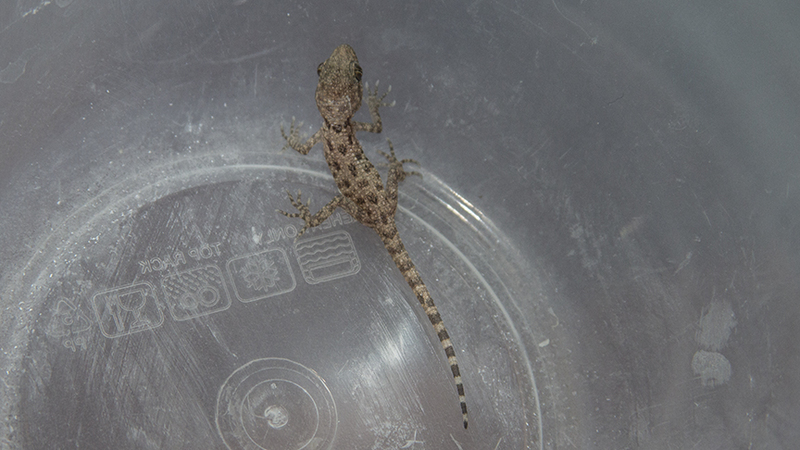 Jan identified them as geckos, placed them in our incubator, and they have all hatched one-by-one. they were all fed (wingless fruit flies) and released outside after sundown. Insect control at it’s most natural! 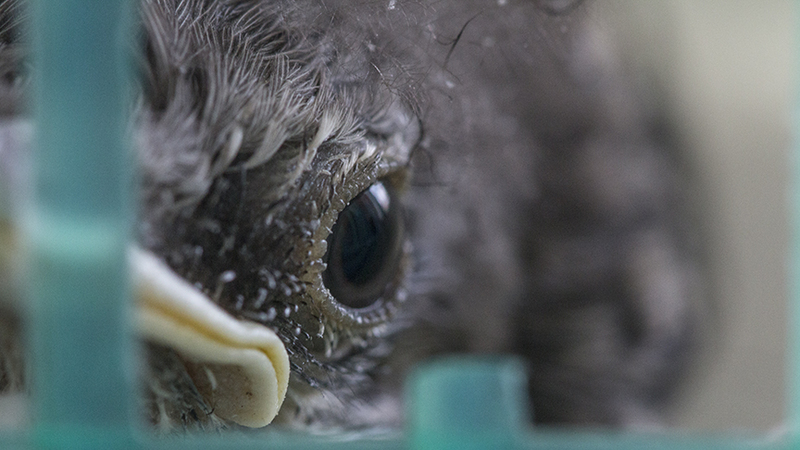 Is there a more eloquent clue that birds have a reptilian heritage? 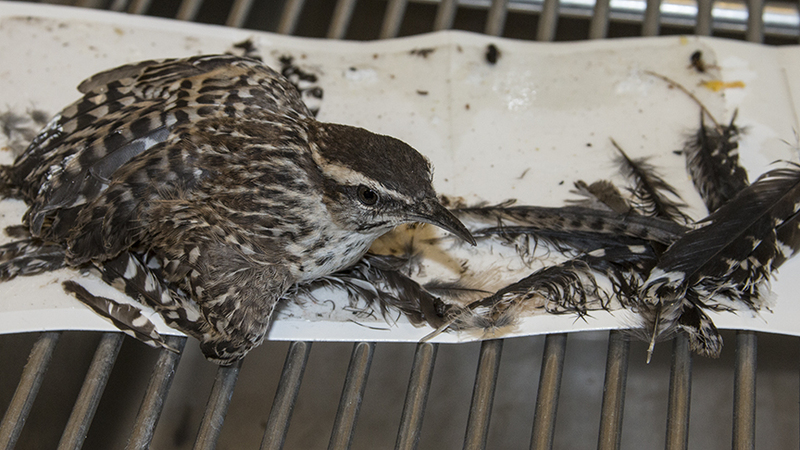 ANOTHER incorrectly used glue trap! 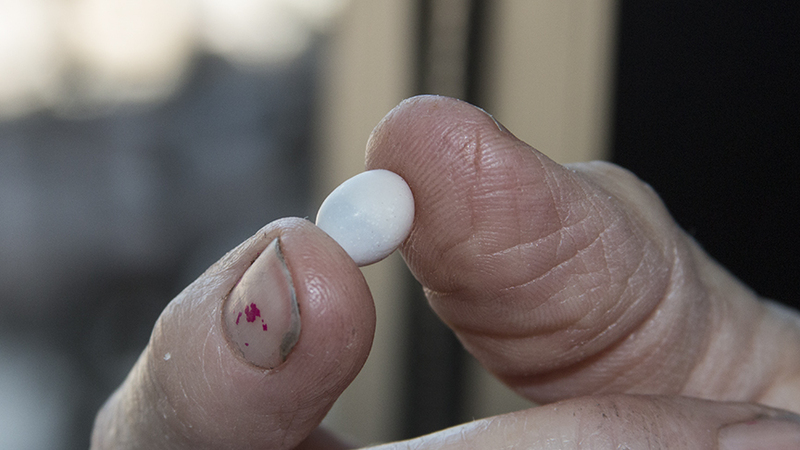 So I don’t know how many times we have to say it, but if you HAVE to use glue cards, at least use them as directed. This means INSIDE use only!! Using them out doors is like applying rodenticide to get rid of mice and rats: it is not species specific and the by-catch is heartbreaking. I have lost count of the number of our State Birds (the cactus wren) that have come to us totally glued to a card that was used outside, like this little guy. 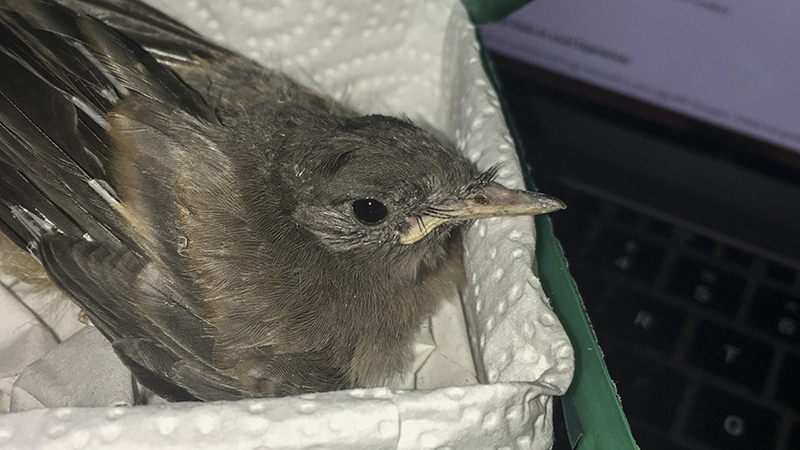 He was eventually removed from the trap, but it will take time for his feathers to molt in replacing the ones damaged by the sticky stuff used in the trap. The Fourth of July fell on a Wednesday this year which meant Liberty was open to the public. We didn’t think we’d have a lot of activity as it was pretty hot and we didn’t do a big publicity push, but we actually had a good sized crowd. Everyone seemed to enjoy the program (eagle feeding and close up looks at hawks and owls. Of course, being the 4th, the bald eagles were a big hit! The prime suspect: White wing dove! The day after the monsoon started off briskly, and kept getting worse as the day went on. The people working triage tried their best to keep up, but animals kept arriving all day. We hit 100 at 3pm and we still had 3 hours to go. 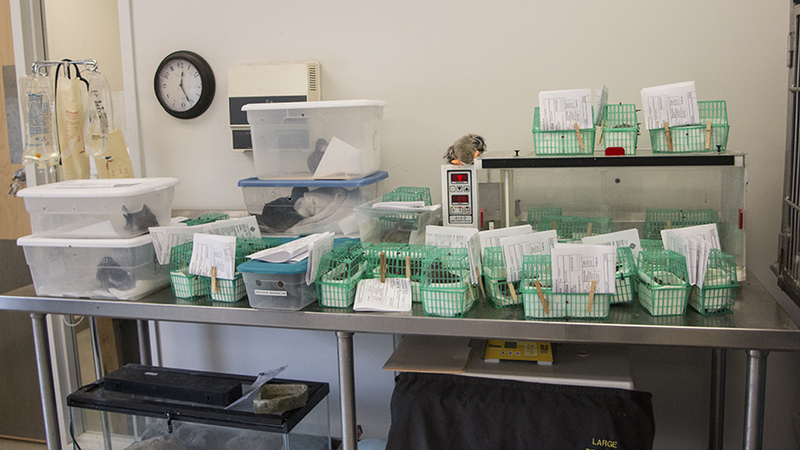 We were trying to keep enough berry baskets stuffed to accommodate the mounting numbers. Eventually, the onslaught abated, but not before we hit a record 138 for the day. We’re proud that nothing is turned away that needs help. Actually, the many different back yard birds are more work and take more time and expertise to successfully rehabilitated than Raptors. Hawks and owls are pretty easy since once they are self feeding, all they need is a supply of mice and they’re good to go. 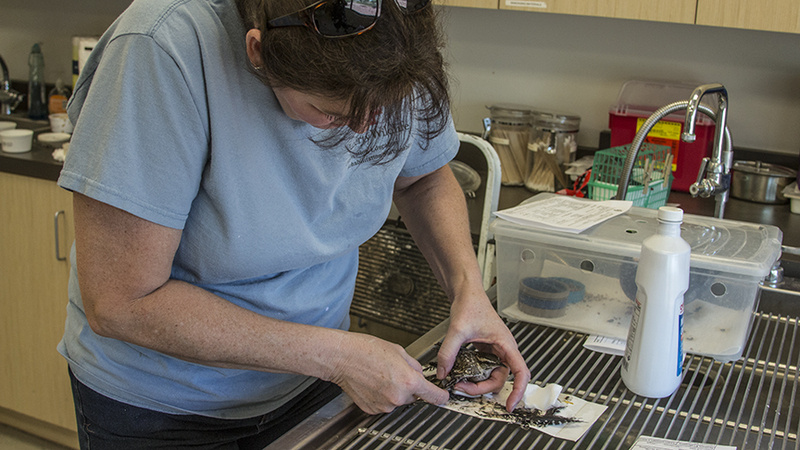 With the doves, quail, grackles, etc., each requires a different unique diet and handling protocol that our volunteers know and apply. 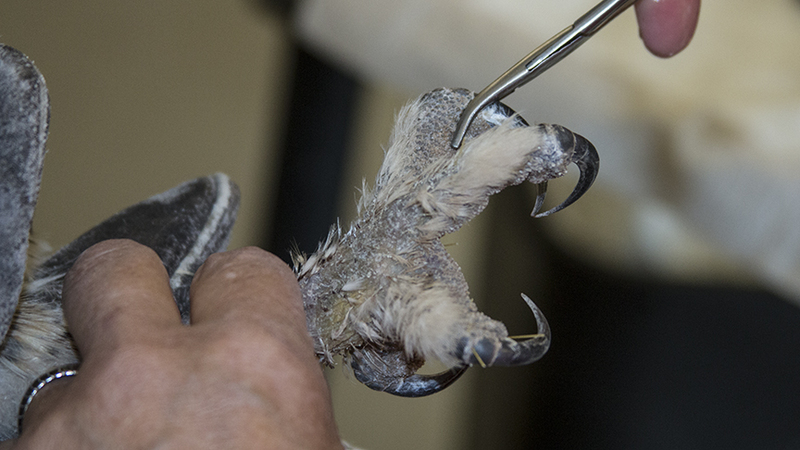 One of the top five reasons birds come to us over time is electrical injury. Many raptors will land on electrical wires and other equipment and if they happen to touch two different conductors, they make an unfortunate connection. They were not designed to conduct thousands of volts and the damage isn’t usually visible as the tissue is burned from the inside. 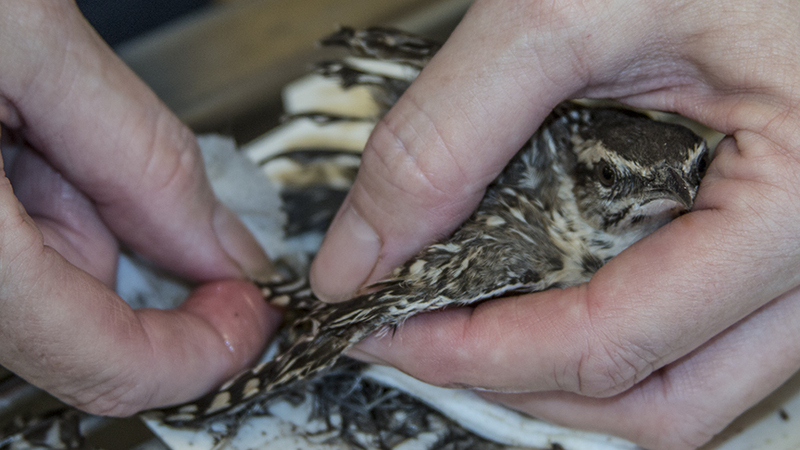 This little owl has lots of burns, both entry and exit marks. 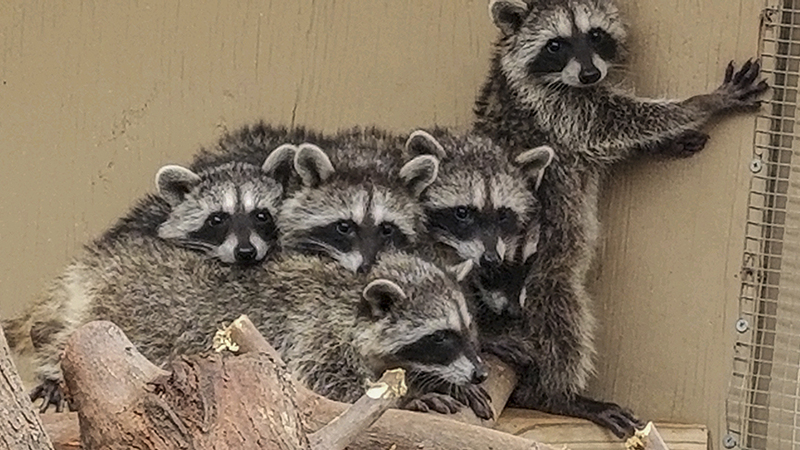 Six young raccoons were taken from their mother not long ago. A “wildlife” service had been called and rather than take the entire family (so they could stay together), the kids were taken without the mom. 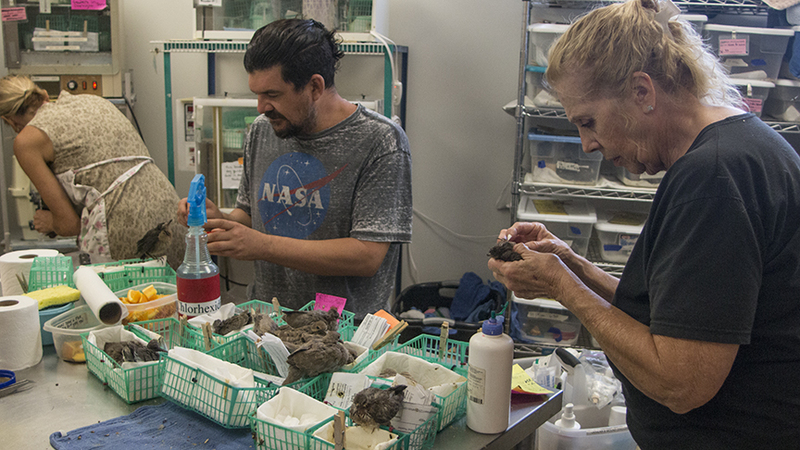 We placed them with our mammal expert, (Rebecca) who raised them from infancy to this post-weaning stage. 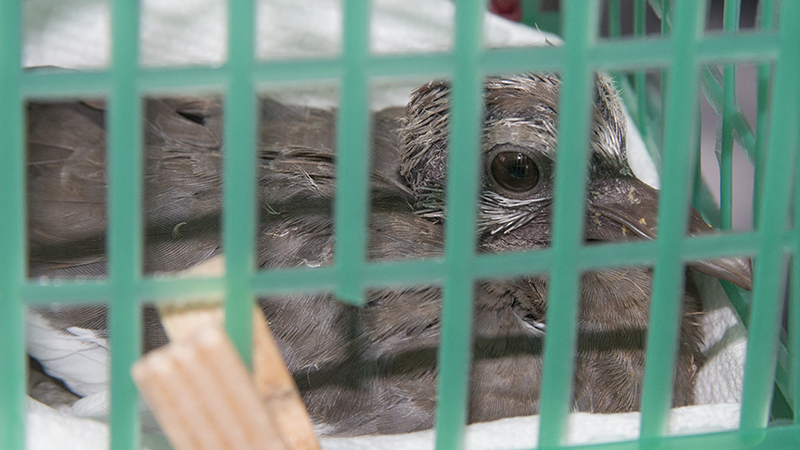 Now they will stay with us until they can be released in an appropriate area. I believe he’s a bobwhite quail. He’s an excellent foster dad! Raised many, many babies. No, he is actually a male Northern Bobwhite. He has been the best (and only) quail foster dad! 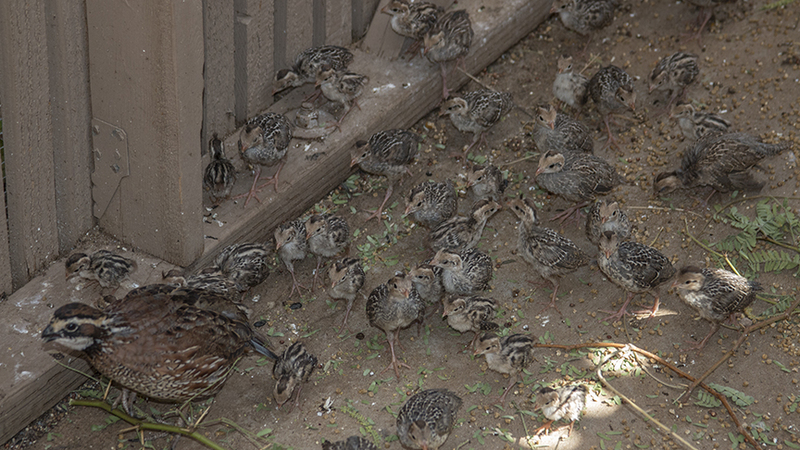 Caring for and raising literally 100’s of baby Gambel quail for over 4 years! He is the reason our success rate with these little cuties has been extremely high.